How do you layer bracelets, without it looking over done? You want to achieve the bohemian feel without it looking like your child got all creative in your jewelry box. This is definitely an art worth mastering, it can lend a great relaxed luxe edge to an outfit, and looks great with simple pieces like a plain black sheath dress. It is also a great way to add a new look to a much worn outfit without having to spend any money. 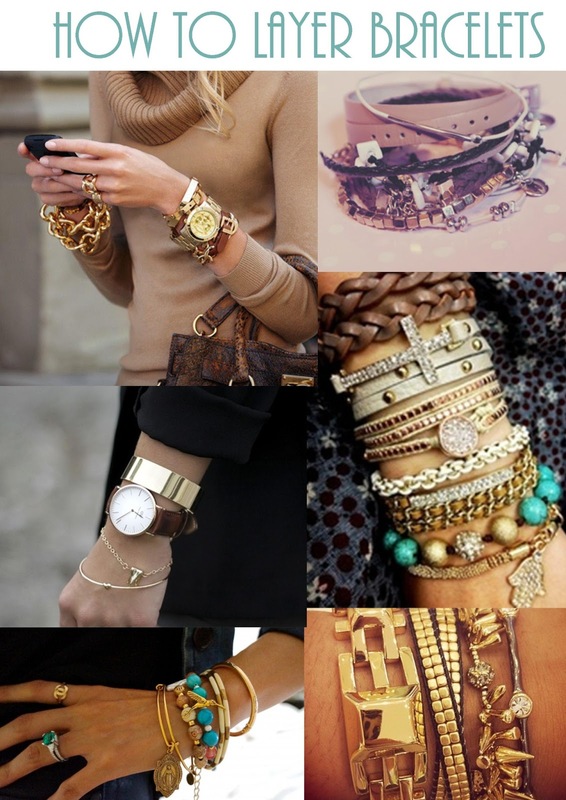 Just have a good rummage around your jewelry drawer and then start seeing which ones look good together. With clothing it has taken me ages to learn to layer effectively and I still doubt that I get it right all the time. With jewelry it is a bit easier, for every rule, I can find an example of it being broken and still looking great. Here is my attempt at trying to bring some order to the chaos. Mix larger more statement pieces with dainty smaller pieces. I say mix metals, my personal everyday bevy of bracelets is predominately white metal, but I have no qualms with bringing some gold to the table. Throw in a pop of colour, Find something that works with your outfit and your colouring, it could either matchs or contrast. I like my bracelt stack to complement my nail varnish. Try to keep other accessories to minimum. Feel free to add your watch, This is a great chance to get those watches you don’t usually wear out of the drawer and get an airing.